All our pumps are gradient, sequential, pneumatic compression devices, intended for the treatment of primary or secondary Lymphedema. 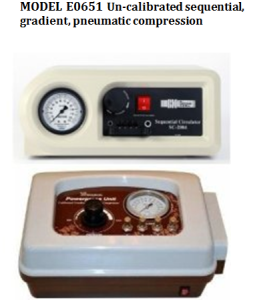 The compression pump is intended for the treatment of Venous Insufficiency, Chronic Venous Stasis Ulcers as well as the general treatment of Lymphedema, pain and swelling of the extremities. The device can be used in the convenience of home or hospital use. E0651-recommended for treatment of Lymphedema and Venous Insufficiency. E0652- recommended for treatment of Lymphedema and Venous Insufficiency as well as serious Venous Stasis Ulcers, Wounds and/or limb tenderness. 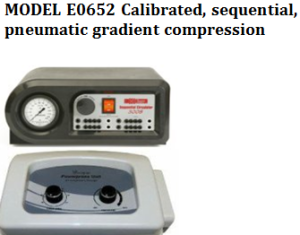 WHAT DO E0651/E0652 PNEUMATIC COMPRESSION PUMPS DO? Rapid Inflation/Deflation Cycle Compression System that sequentially compresses both the foot and calf in patients suffering from Peripheral Arterial Disease (PAD). 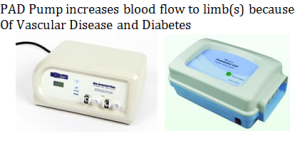 Increases blood flow in lower limbs for those with Diabetes, Arteriosclerosis, Amputations (minor), Angioplasty, High Blood Pressure, Blood Clots The PAD pump creates collateral arteries and helps salvage limbs. 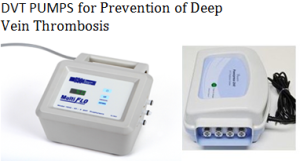 Provides treatment to prevent DVT (blood clots) after surgery, Prolonged inactivity (hospital stay, car or plane trips;) heart attack, Stroke or for those with cancer, paralysis, extra weight or smoke; Provides more rapid healing time after surgery Enhances venous and arterial circulation to prevent blood clots (Deep Vein Thrombosis) and swelling. Foot, Calf, Thigh Treatment; Single or bilateral garments available. State of the Art compression pump delivers pressure to each and every chamber in the garment to give the best possible treatment. 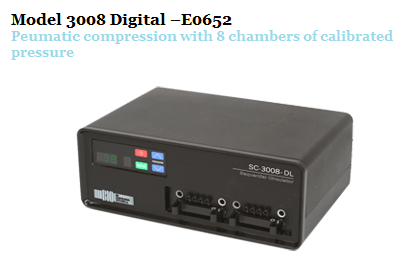 The SC-3008-DL lets the user program the pressure setting in any and all of the 8 chambers, always keeping greater pressure distal (bottom) so as to avoid any reflux. Complete with a compliance meter to monitor patient use, the SC-3008-DL also has a countdown clock and a timer that shuts off the pump after one hour.